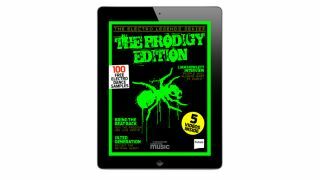 A Prodigy mag for the iOS generation. If you've ever wondered how The Prodigy managed to stay on top of the electro scene for close to two decades, a new iPad and iPhone special might be about to shed some light. Designed to appeal to Prodigy fans as well as music makers, The Electro Legends Series: Prodigy Edition is out now for £1.99 via the App Store apps of either Future Music or Computer Music. Inside you'll find a classic Liam Howlett interview, as well as the inside story of the band's rise to fame by the founder of XL Recordings. You'll also get video analysis of The Prodigy by Enter Shikari, a reappraisal of Jilted Generation, plus an exclusive look at The Prodigy's live drumming setup and a combination of video tutorials and free samples for musicians. The Electro Legends Series: Prodigy Edition is out now for £1.99. To download it, just get the free apps of Computer Music or Future Music.